Every cook needs a good sponge pudding recipe. 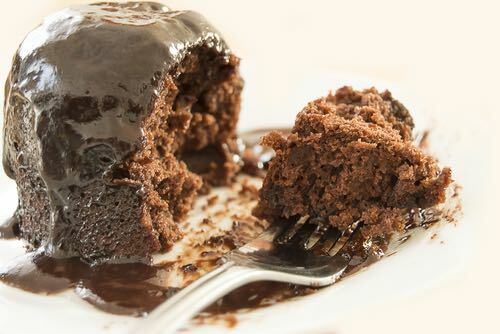 One sponge dessert leads to another. Everybody likes them, and once you catch the main idea they can be varied by changing the flavoring and maybe tickling up the portions a little. Obviously, the eggs used are the fluffer-uppers, the gelatin holds the whole business together, and beyond that you have only liquid and flavoring to add. Below are several dandy possibilities, bound to please the family. 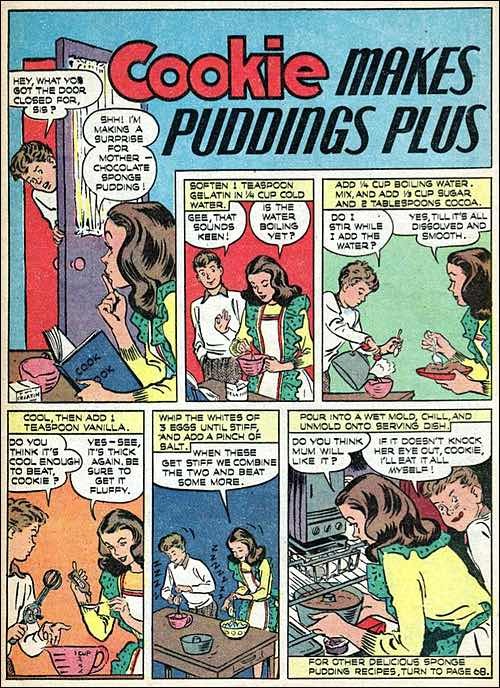 In the above illustration, Cookie demonstrates how to make this basic sponge dessert pudding flavored with cocoa powder. Soften 1 teaspoon gelatin in 1/4 cup cold water. Add 1/4 cup boiling water while stirring. 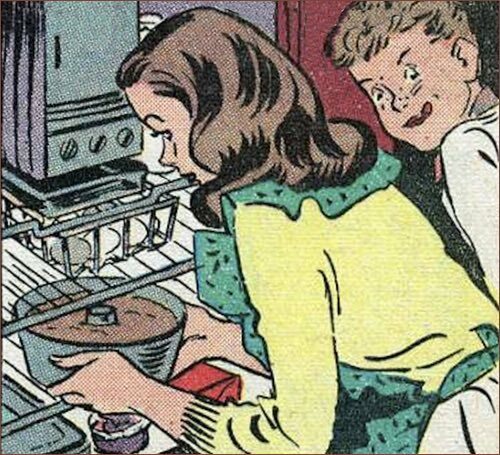 Mix, and add 1/3 cup sugar, and 2 tablespoons cocoa. Cool, then add 1 teaspoon vanilla. Beat until fluffy. Whip the whites of 3 eggs until stiff, add a pinch of salt, combine with pudding mixture, and beat some more. Pour into a wet mold, chill, and unmold onto a serving dish. Start out just like the basic recipe (above), soaking your tablespoon of gelatin in 1/4 cup of cold water, adding an equal quantity of hot. Stir in 1/2 cup sugar, 1/4 teaspoon of salt, and 1 teaspoon of lemon juice (it adds a zip to all fruit flavors). Cool, beat, and add 2 beaten egg whites, folding them lightly into the mixture. Mold and chill. Serves about six. Especially good in winter when fresh fruits are scarce. Soak 1/2 pound of dried apricots overnight in 2 cups of cold water. Bring slowly to a boil and continue to cook slowly till tender. Up the gelatin in the basic sponge pudding recipe to 1-1/2 tablespoons, and soften it in 1/2 cup of the apricot juice. Boil another 1/2 cup of juice with 1-1/4 cups of sugar, and use this to dissolve the gelatin. You can spike the flavor with 2 or 3 tablespoons of lemon juice. Add the mashed pulp, cool, and add 4 beaten egg whites and a pinch of salt. Mold and chill. Enough for about eight servings.